In our environment, there are all kinds of sounds, some of which are noise. With the development of human civilization, the quiet environments are less and less, but more and more noisy environments instead. Staying in the noise for long time will have an impact on hearing, which is bad for health. 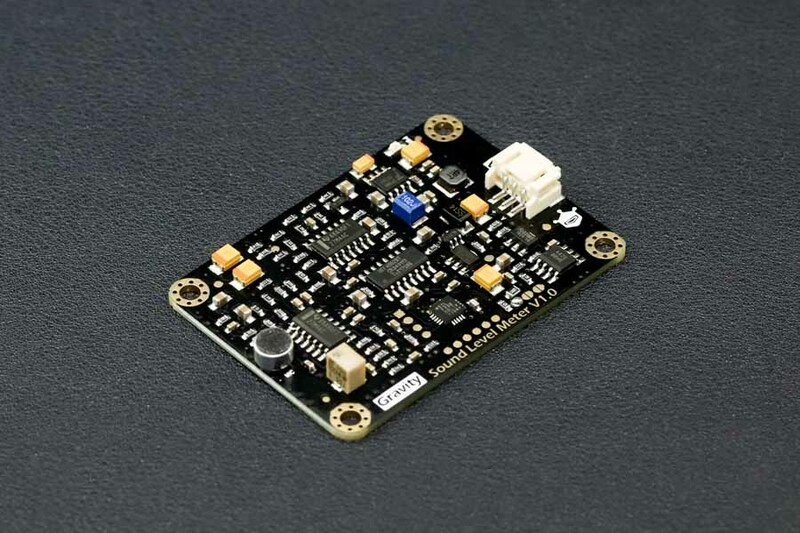 Sound level meter (also known as the decibel meter, noise meter) is a basic noise measurement instrument.We have launched a sound level meter, which is compatible with Arduino, plug-and-play . It can accurately measure the sound level of the surrounding environment. This product uses instrument circuit, low noise microphone, which makes it highly precious. It supports 3.3~5.0V wide input voltage, 0.6~2.6V voltage output. The decibel value is linear with the output voltage, which leads to a simple conversion, without complex algorithm.The connector is plug-and-play, without welding, so this product can be easily used in your application. The black film on the microphone is a sensitive component, do not touch it with fingernails or other sharp objects. Do not place this module on the surface of the conductor or the semiconductor, otherwise it will short the microphone’s pins. It is recommended to place this module on a dry insulator’s surface or secure with nylon columns to hang in the air. This tutorial will show you how to use this module to measure the decibel value of surrounding environment. 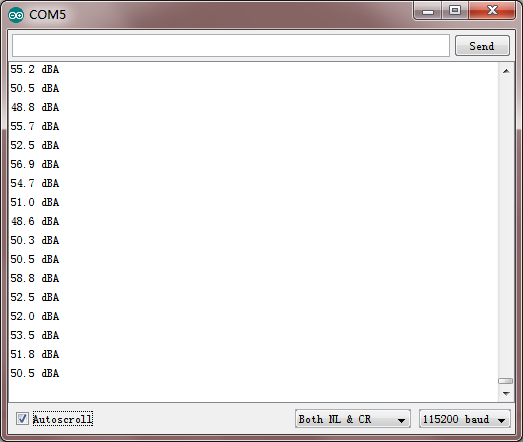 This sample code is used to test the analog sound level meter. 1. 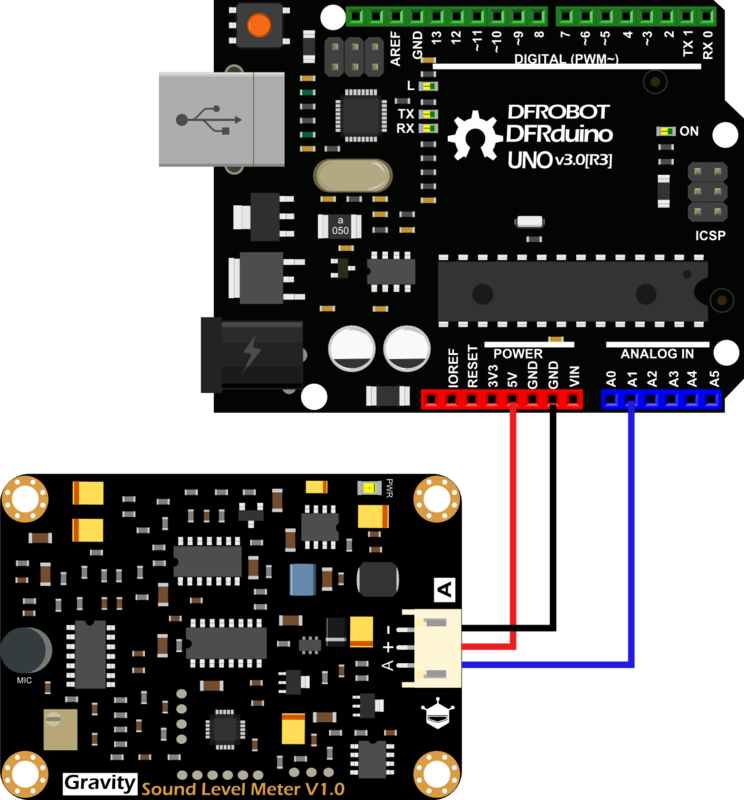 This sample code is tested on Arduino Uno with Arduino IDE 1.0.5 r2. 2. In order to protect the microphone on the board, you should not touch the black membrane on the microphone. Also you should keep it clean. 3. Please do not place this module on the surface of  conductor or semiconductor. Otherwise, this will cause the microphone pin to be shorted. After uploading the sample code, you can open the serial monitor, and get the decibel value. The test environment is the office.The decibel value is shown as below. For this product,the decibel value is linear with the output voltage.When the output voltage is 0.6V, the decibel value should be 30dBA. When the output voltage is 2.6V, the decibel value should be 130dBA. The calibration is done before leaving the factory, so you don't need to calibrate it. 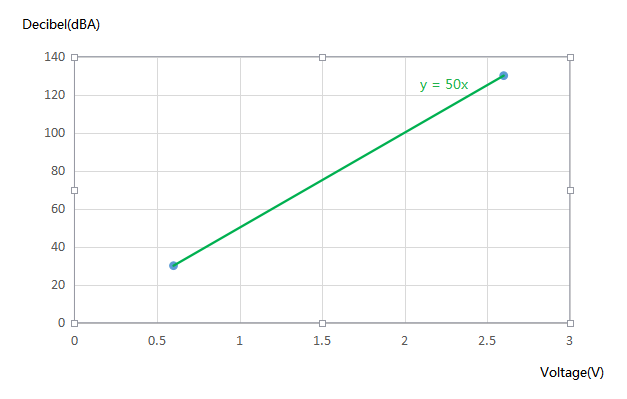 So we can get this relation: Decibel Value(dBA) = Output Voltage(V) × 50, as shown below. Q1. Why is the decibel value unstable, and constantly varying? Is this normal? A1. The decibel value measured by the sound level meter is the sound level of a short period of time (about hundreds of milliseconds), so the value is a instantaneous value. The sound level meter is measuring constantly, and at different times the sound is varing, so the decibel should be varing . This is normal. Q2. Although the environment is very quiet, but the decibel value is not less than 30dbA. Why? A2. In our living environment, there is always a little sound . Human's ear is hard to hear the sound below 30dBA, but the equipment still can detect the sound. So it is difficult for the sound level to be less than 30dBA in our living environment. 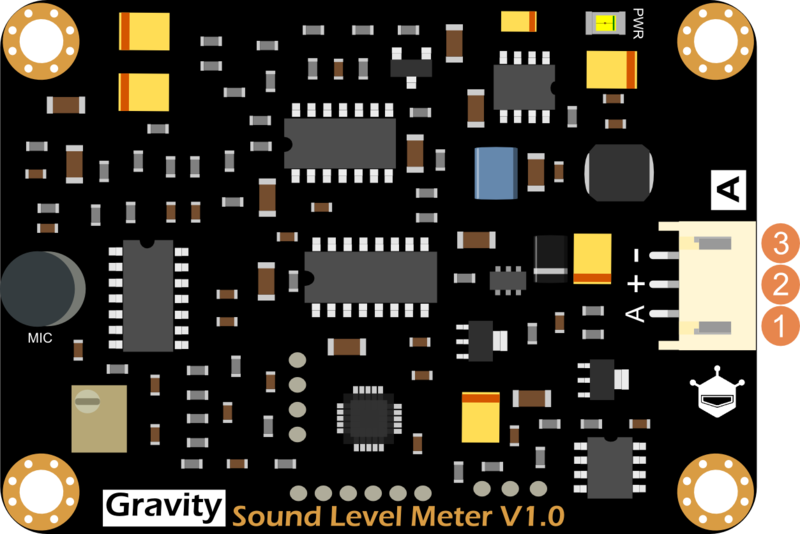 Get Gravity: Analog Sound Level Meter SKU:SEN0232 from DFRobot Store or DFRobot Distributor.